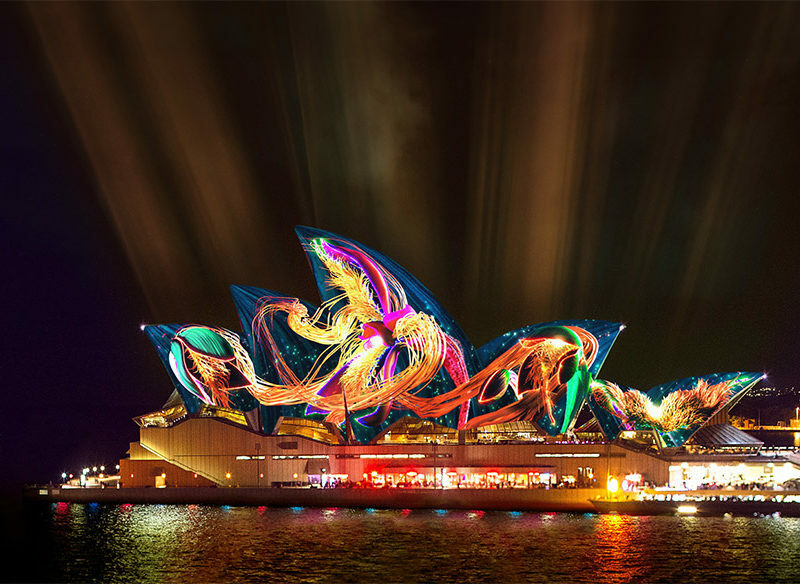 It’s hard to imagine Sydney in winter without Vivid Sydney. Maybe because it’s officially been happening for 11 years. Running from Friday 24 May to Saturday 15 June, lucky spectators will have the chance to see the world-class event filled with light, installations, talks and musical performances. And with 23 nights of innovation across 11 locations, here’s where you can catch the best of the best across its light, music and ideas programs. Movie fans will know Pixar Animation Studios as the creators of many household names, and this year, they will be illuminating Sydney’s heritage-listed Argyle Cut in The Rocks with a creative light projection filled with iconic animation. Expect the captivating characters of Pixar films, which includes the beloved duo of Woody and Buzz Lightyear, as well as Nemo, Dory, The Incredibles and oh so much more. Visitors can once again weave their way through the Royal Botanic Garden Sydney for close encounters with illuminated artworks that reflect and refract both light and nature. Glowing, darting, hovering above the ground, Firefly Field is a mesmerising installation of 500 flying light points that simulate the aerial ballet of these tiny nocturnal lampyridae. Across the Quay, the imposing art-deco façade of the Museum of Contemporary Art Australia will be transformed by award-winning Australian-Columbian artist Claudia Nicholson who, together with light veterans Spinifex Group, reimagine her vibrant artworks into Let Me Down, an animated cycle of creation, destruction and regeneration underscored by the cool and contemporary sounds of Lonelyspeck. Celebrating the International Year of Indigenous Languages, the southern pylon of Sydney Harbour Bridge is set to come to life with Eora: Broken Spear curated by Rhoda Roberts AO with projection design by The Electric Canvas. This powerful work reminds us to reflect, to call country, to read country and listen to country. In its second year, the ever-grinning Luna Park Sydney dazzles again after dark. This year adrenaline seekers can get airborne in the new family thriller Volaré studded with thousands of LED lights which perfectly complements the light-laced iconic Ferris Wheel. Vivid Sydney wouldn’t feel complete without installations at family favourite Chatswood. The Concourse will shine with Co-existence, a large-scale projection work by Hungarian artist collective Limelight. Light installations will also be held at other iconic Sydney locations, including Barangaroo, Darling Harbour, Taronga Zoo, Custom’s House and more. Uniting quality dance music with stunning visuals and an industrial setting, Curve Ball is the warehouse party you need to be adding to your VIVID agenda. Lineup highlights include Hayden James, Mallrat, Touch Sensitive, Set Mo, Young Franco plus many more. Once again, the majestic space will be enhanced with beautiful visuals and sound, ready to ignite your senses as you dance to the sounds of some of the world’s best. Exclusive to Vivid LIVE, alternative rock legends The Cure will bring their magisterial, slow-burn masterpiece Disintegration to the Opera House Concert Hall for four shows to mark the 30th anniversary of their career-defining epic. Don’t miss this, it’s sure to be a big one. You probably know pop-icon Kate Miller-Heidke, and you probably know composer and director Iain Grandage. For the first time however, the powerful music duo are joining forces for a re-imagination of Kate’s unique music that effortlessly melds indie, pop and opera. The results will be an intimate spectacle, showcasing some of the best talents in Australian music. This year’s Game Changers challenge assumptions on race and relationships, featuring a lineup of impressive individuals keen to make you think. Hollywood trailblazer Spike Lee opens up about his personal politics, story-craft and tips for making movies that matter, while iconic psychotherapist and creator of the wildly popular podcast Where Should We Begin? Esther Perel investigates modern love in the digital age and looks at the ways relationships are being affected by technology. At this event, guests will be privy to the minds of four design and environment experts keen to discuss the use of typography and signage in an urban context. Take a look at how how signage is used to influence, modify and comment on human behaviours, in both Sydney and beyond. If you aren’t already aware of Vogue Codes, allow us to acquaint you. For four years, the fashion powerhouse have been hosting a panel that empowers future female innovation, connecting attendees with trailblazers who are influencing the technology landscape globally. This year, hear from international and Australian panelists and keynote speakers who are driving action and change in the technology industry. Despite numbers revealing that women represent only 34 per cent of entrepreneurs, the number of female entrepreneurs is growing at a faster rate than for men. Determined to empower women and shift the gap, Future Women and Sylvia Jeffreys are sharing the inspirational stories behind some of Australia’s most distinguished female entrepreneurs and investors under one incredible roof. To view the VIVID 2019 program in its entirety, visit the website here. Due to the light installations and huge crowds entering the city, there will be major road closures each night in the CBD, The Rocks and Walsh Bay. Street parking will be extremely limited so we recommend you leave the car at home and take advantage of the extra bus and train services that will be running. Some of the best train stations to access attractions are Circular Quay, Wynyard, Town Hall and Chatswood. Ferries and the light rail are also great options to move throughout the city and harbour. For those who will be visiting with children or want to avoid the hustle and bustle, we recommend visiting Monday to Thursday. During the week, the streets and displays will be quieter and more accessible. The festival’s busiest nights are Friday, Saturday, Sunday, and the June long weekend, so if possible, avoid these nights to optimise your interaction with the installations.